Fiction – paperback; Michael O’Mara Books; 346 pages; 2014. Review copy courtesy of the publisher. 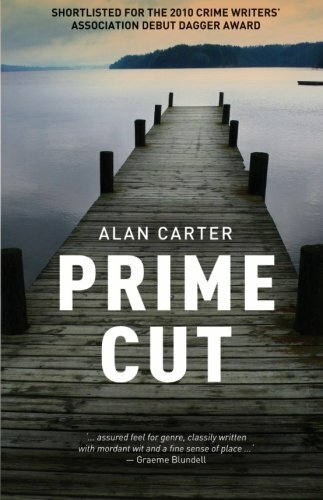 The unpublished manuscript of Alan Carter’s Prime Cut was shortlisted for the 2010 Crime Writer’s Association Debut Dagger Award. The following year it was published in Australia by Fremantle Press, and earlier this year it was published in the UK by Michael O’Mara Books. In a nutshell, it is a first-rate crime thriller. It’s fast-paced without skipping over detail and it feels incredibly evocative of time and place — a mining community on the Western Australian coast in October 2008, just as the rest of the Western world is heading into economic meltdown. The book is structured around two narrative threads that eventually come together in an unexpected — and ultimately — shocking way. The first revolves around Stuart Miller, an English police detective who quit the force after a particularly harrowing murder case in Sunderland, England, in 1973. He decamped to Australia, where he has been living ever since with his Scottish wife. But he’s been mentally scarred by what he saw the day the “Cup Final killer”, Davey Arthurs, electrocuted and then blugeoned to death his wife and child. Now, 35 years later, someone with the same modus operandi has struck in the Adelaide hills, and Stuart can’t help wondering if it’s the same man. The second narrative focuses on Detective Senior Sergeant Cato Kwong, a Chinese-Australian, who’s been banished to the Stock Squad, which investigates crime in the outback relating to sheep, cattle and roadkill, following a fall from grace. But he’s called back in from the cold to head up a murder investigation when a torso is washed up on the coast. His return to “proper” police work brings him back into contact with an old colleague, Senior Sergeant Tess Maguire, which adds additional complications he doesn’t really doesn’t need. Prime Cut is a proper police procedural — and an excellent one at that. Carter expertly captures the working relationships, dynamics and internal politics of a group of cops working in an isolated area, mainly through the use of pitch-perfect, often witty (and sometimes cutting) dialogue and superb characterisation. And he also shows us their home lives, and gives us some insights into their inner-most thoughts, which provides the story with a welcome literary twist. The only cliche, aside from the fact that none of the police in this novel are happily married, is the romantic element that creeps into the storyline, but I’ll forgive Carter that one foible, because this is such a compelling, complex and deftly written novel. Its real strength, however, lies in its sense of time and place; Carter conveys the spirit of Hopetoun, on the Western Australian coast, which is renowned for its beauty and it’s nickel mining operations, not only by describing it so evocatively but by also giving us a kind of snapshot of a community on the edge, one that is being quickly changed by a mining boom bringing in new people, new money and new problems. Carter’s background in directing television documentaries may explain why this book feels so sharp, “alive” and real. There’s a certain cinematic quality to the writing, too, because it’s so visual. And it’s brimming with narrative tension, which makes me wonder why some clever production company hasn’t snapped up the rights to turn this into a film or telemovie. Overall, this is one of the finest police procedurals I’ve read in a long while — and I’m delighted to see a follow-up, Getting Warmer, has also been published. That one has promptly risen to the top of my wishlist. I have been looking for some books to give to my husband for his birthday coming up. I read this review and know he’ll love it. I have ordered it. Thanks for such a great review. I hope your husband enjoys it, Pam. I thought it a very good police procedural, a little bit more intelligent than your run-of-the-mill crime novel. I bought this book after reading your review – really enjoyed it!